Fixed strange behavior where new donations weren't alerting. Fixed the names not displaying correctly on the team totals, after they changed the API slightly. There is now a (rudimentary) progress bar that you can pop open and capture. You can set colors under the settings window, and key out the background. It updates whenever your totals are updated. If I get time, I may work on a circular progress indicator, but it's getting close to gameday, and I'm not sure I'll have time. Fixed bug: When servers were slow, personal totals would display as $0 while waiting for server responses. Donation amounts that are hidden, for whatever reason, are handled a little more gracefully. Omitted at times, displayed as (hidden) in others, and wording changed in some spots. If all donations are hidden, then your top donation will always be $0, but there's not much I can do about that. Your total is now pulled from your user page, rather than the sum of your public donations. This piece of data may not be as current (I think they only update that page every 15 minutes) but it will always be accurate to the moment it was last updated by the EL servers. When you change user ID, all previous donations in the queue are cleared. Prevents my donations from alerting before all yours when you first change the ID. Added "clear" buttons for both image and sound to deselect your setting. Alright, finally ready to release this thing out into the public. It's still in Beta, and there are likely still bugs hiding that I haven't ironed out. My email is in the application to submit bug reports to. So you download it, and install it. You'll need Adobe Air, which you can get at Adobe.com. It will fill in my ID as a default. To change it, head over to Settings and fill in your ID from your URL (the numeric one, not your screen name). After you save, it should refresh the display with your information, not mine. If for some reason it doesn't, hit the 'Force refresh' button. Click Tracker to bring up the window where New Donation alerts will be displayed. It should be flashing all donations you have already received. I'll explain this more later. You should be good go to. Once you've set up your ID/settings the program checks your donation list every 30 seconds. Every 15 minutes, it also checks for team information (if you're on a team). It updates the display inside the app window, but also sends information in various formats out to text files in a folder on your Desktop titled "extra-life-output". The titles should be pretty self-explanatory. Every time it detects a donation that it hasn't seen before, it adds that to a locally-stored database. Simultaneously to all that, every 10 seconds, it is checking that database for any donations that have yet to be displayed in the alert window. If it finds one, it displays the image and plays the sound you've selected, along with the name and amount of the donator. If you don't have the tracker window open, that check simply exits out. This means if you have the application open, but not the alert window open, any donations received during that time are queued up for the next time the tracker is opened. It will play the alert once for every donation. So the first time you open the app (or open it after not having opened it for a while) you're going to get to hear your donation alert a few times (hopefully a lot of times, which means you've raised a ton of money for CMN). There are a couple buttons up in the top right corner for utility, one to force a refresh of all data (Both individual and Team), as well as a 'Test Alert' button to trigger an alert to see what it looks like. It'll check to see if there's a new version available and give you a button pointing to the new version. There's also a button to donate to my EL page if you like it *HINTCOUGHCOUGHHINT*. So the box for the alerts is approximately (may vary based on your OS) 685px wide by 215 px tall. That's what you're aiming for when creating images to use on your alert. The alert sound must be in MP3 format. You can use something like this to convert it to MP3 format if it isn't already. The text files this thing spits out can be used in OBS (via the "Text" source") and X-Split (using the "Title" source) pretty easily. Using those tools, you can set the size, font, outlines, scroll speed, etc, of any of that information. It behaves in the same was as most of the "Now Playing" type plugins out there. If you're confused, YouTube and google have plenty of tutorials on both tools and how to place text files in your stream stage. Refactor the code so it's not too embarrassing to put on GitHub. I think I've covered everything it does, but if I forgot, let me know and I'll update this thread. I'm planning on using this thread as the 'home' for future updates, since it seems to have evolved from what I'd mentioned in other threads. I apologize if I'm cluttering the front page of the forum with this. I'll update the title as well as the in-app notification when I release new versions, and you can come back here to find out what's new. If you have any questions, please let me know here or via the e-mail listed in the app. 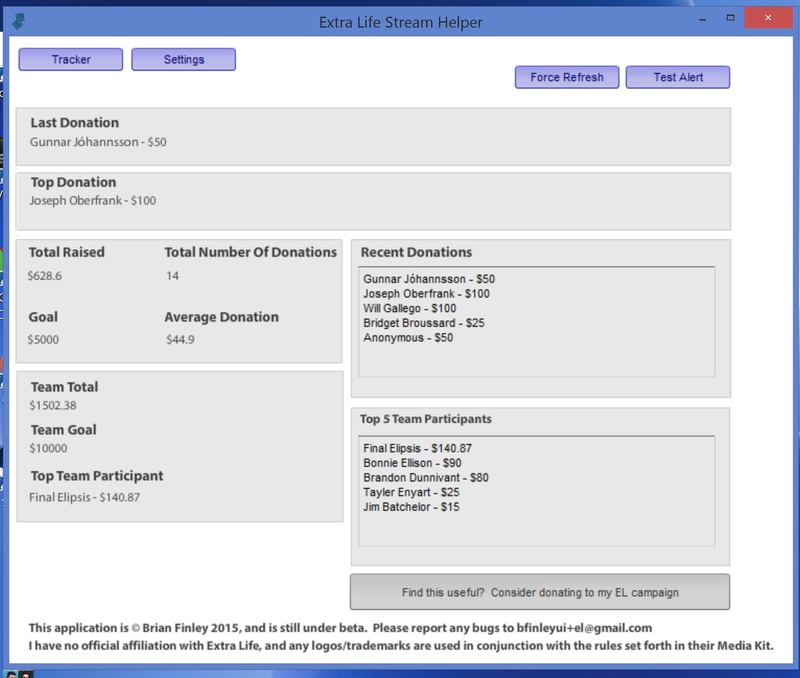 If you enjoy the tool, please consider donating to my Extra Life Fundraiser. My niece was born with Hypoplastic Left Heart syndrome, basically meaning she had only one half of her heart. Three open heart surgeries during her first year of life at the hospital I'm raising money for, the University of Iowa Children's Hospital, and she's now a super energetic, sassy, awesome 2nd grader. She'll likely need a heart transplant as she nears her adult life, but even 20 years ago, these children didn't survive, so I'm extremely grateful to CMN hospitals, the UI Children's Hospital, and everyone who's ever thought about maybe helping a sick child get better. Edit: Fixed the actual download link. I'm an idiot. I don't know what you're talking about, I have a cold and really weird, full-word, bold typos. It looks awesome! I might have to use this, if only for the donation alerts! One thing I noticed immediately: I set a background image for the Alert to test it out. When I tried to clear the selection, however, the app wouldn't let me select nothing, and I was forced to (temporarily) keep some image there. I was able to work around this by deleting the copied images under Desktop\extra-life-output\, but a built-in option to clear your selection would be nice. I assume the same issue will happen for sound effects. That makes a ton of sense and won't be difficult. Will do for the next version! Thanks! Something I noticed, and I may be doing something wrong because generally speaking with this sort of thing I'm over my head, but the team listing seems odd. It lists the top 5 people/top person on my team, but it's completely inaccurate. The top and top 5 listed are not the top nor top 5 on my team. Can you post or e-mail me a screenshot of what it's showing you? Me, $628.60; Krystle Spies, $195; Final Ellipsis, $140.87; Augustine Villani, $118; Bonnie Ellison, $90. Just for reference, since two of them are showing up. Something changed on the Extra Life site. Instead of presenting the team rosters in descending order of total donations, it has suddenly started presenting them in some other order. Maybe newest members? It's affected the display on the main web pages as well. Not sure if there's anything to be done at this point, because to manually sort would require an API transaction for each member of the team, which would probably anger their servers, especially teams with hundreds/thousands of gamers. I tweeted at Rick Heaton, hopefully this is an easy fix, because otherwise that sort of disables any team information stuff. Figured out it's currently being sorted by Last Name. Guessing an SQL got borked someplace that generates that list. When Extra Life gets around to fixing it again, it should just 'start working' again. Hoping that's soon, that's sort of a bummer. Yeah, I just noticed that too. Oh well. Just wanted to make sure I hadn't had a case of the dumbs and done something silly when I set it up. So far so good, though the program doesn't seem to want to play my .mp3 alert files at the moment. I've tried a few different ones but none of them seem to play within the program. Can you e-mail me the MP3s you're using, along with your operating system and version, etc? I ran into this issue too, but it worked after closing and re-opening the program. But it didn't work when I initially set the MP3 file and tested it. This was the same workaround I used as well. - Personal totals keep flipping to $0, and reset after mandatory refresh. - Only top donation displayed in last 5. Other donations, although public, are listing as hidden. When you say 'personal totals', which ones are you referring to? I can't seem to get it to duplicate the behavior you're referring to. Are you seeing it on the app itself, or in text files? Edit: Nevermind, found it. See, that's what I meant when i said "famous last words"... I knew something would bork that I'd miss. Working on it now. Updated to fix these issues, I believe. Also, your fix to account for anonymous donation amounts worked! Any chance this works for Team IDs? If not, anybody have/know of a solution for tracking donations to teams? (Also, this plugin looks awesome and you are amazing for making/posting it). [Edit] - Apparently I can't read. Never mind. This program is awesome and you are awesome. Is there a way we can select where the data is being stored or is this being determined by Adobe Air? I just picked the desktop as a fairly easily accessible location. Is there a reason that doesn't work? I can look into trying to set a custom location, but probably wouldn't be able to deploy that change until tomorrow. Oh, no. Its fine. I'm just a stickler for clean desktops. Don't mind me. Great app and I can't wait to use it this weekend! However, are you planning on open sourcing this?